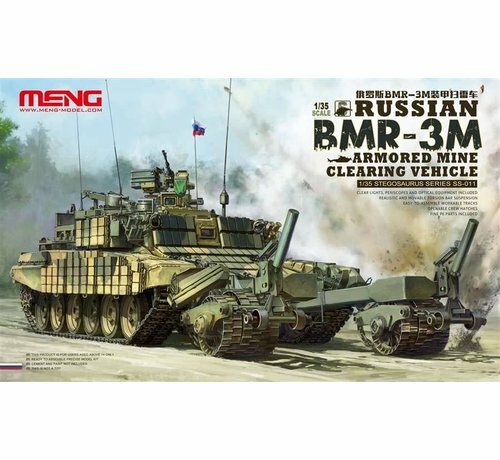 This plastic model tank kit of the BMR-3M mine clearing vehicle By Meng Models. 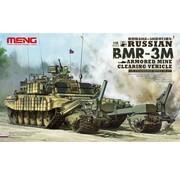 Plastic model tank kit of the BMR-3M mine clearing vehicle. 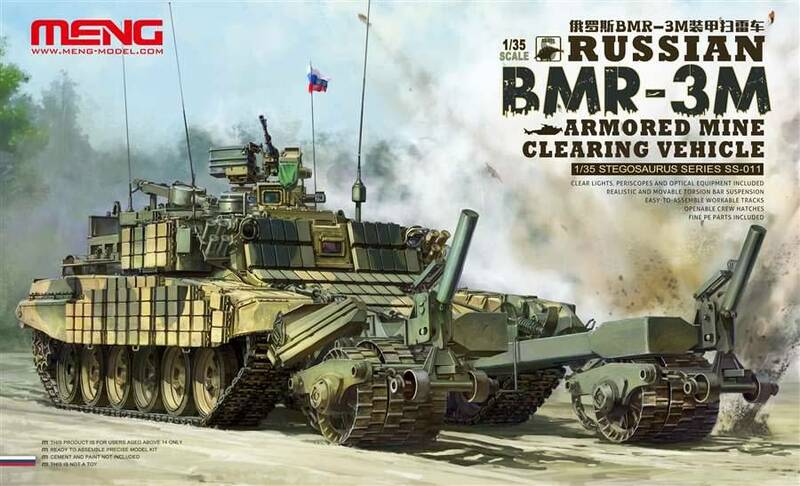 Developed as a private venture, it is a proposed replacement for the current Russian Army BMR-2 mine clearing vehicle, based on the T-54 medium tank. The mine clearing vehicle is mainly intended for road mine clearing, while escorting convoys. Kit has single piece lower hull, belly armor, multi-part upper hull and turret with exterior detail, hinged hatches, crane, ERA blocks, 12.7 mm DShK anti-aircraft machine gun, smoke grenade dischargers, antennas, cylindrical fuel drums, injection molded tow cable, trenching log, storage box, spare ammo box, self entrenching device, KMT-7 mine roller, KMT-8 mine clearing plough, EMT electromagnetic countermine system, detailed running gear (road wheels, idlers, sprockets, torsion bar) movable, workable Individual track links, clear (lights, vision ports, periscope and optical equipment), photoetch (engine grilles). Decals and color painting guide for (3) tanks of the Russia Arms Expo: 2009, 2011 and 2015.